We were recently recognized by the State Senator for Chester County area for hosting a Give a Kid a Smile Day in our office! Thus, we wanted let our friends know how important we find serving the community is. For a few years, our office has been known for accepting many types of insurance, public insurance, and providing reasonable and affordable rates for our patients without insurance. We are under the firm belief that every single person deserves a beautiful new smile and our goal is to provide that to the Upland, Chester, Woodlyn, Aston, and Brookhaven communities. We have been reaching out to our local community since the beginning and its thanks to these communities that our office has been thriving these last few years. We are grateful for our communities and our patients and we treat them in the most affordable way to ensure that every person has a great smile and can maintain their oral health at an affordable rate. We take great pride when our work so community focused is recognized by elected officials in our area. We thank you Senator McGarrigle for your great service for our area and our communities and thank you for your appreciation of how we serve the community and try our best to make dental healthcare available to all the members of our local communities. 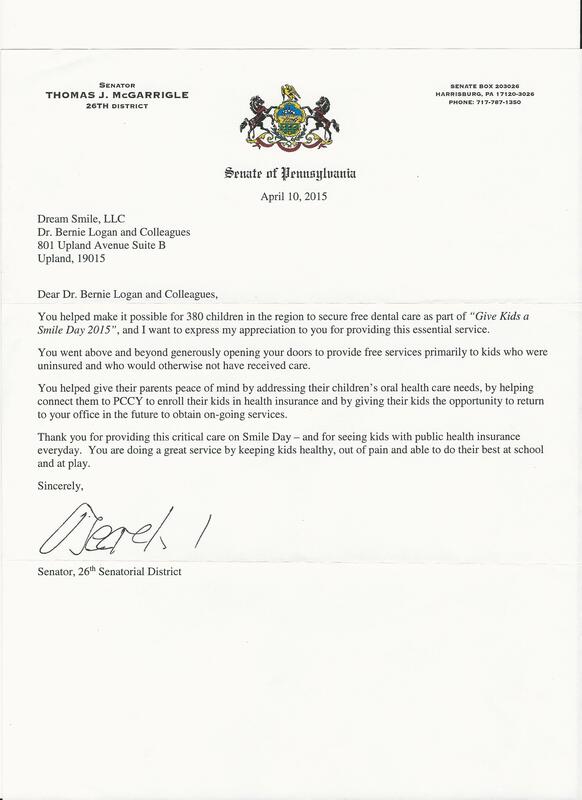 Letter from State Senator Thomas McGarrigle thanking our office for hosting for Give a Kid a Smile Day. We found some very kind words about our practice and we were very thrilled to see that. We love the Upland area and as a result of all of our patients we are able to succeed. We like to thank them by accepting most insurance and dental coverage, and providing affordable rates for everyone. Thanks to all of our loyal patients and communities for all of your support.